Free poop bags will be available at selected locations in Fife. Dog walkers in Fife parks and at beaches will soon have no excuse for not picking up their pooch’s poop. Poop bags will be available free in 35 locations after the go-ahead was given for specially designed stands to be installed. The stations, which will come at no cost to the council, will be installed by a company called TiksPac and will be sponsored by local businesses who want to display their commitment to the community. A survey carried out by Fife Council shows that dog fouling was a regular concern. In 2018, 82 per cent of respondents said that dealing with dog fouling was important or very important in their area. At the same time, less than 30 per cent said they were satisfied with how the council dealt with the mess, with more than 1200 complaints received in 2016/17. Councillor Andy Heer said: “I welcome this initiative by TiksPac and local businesses. 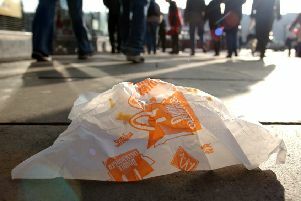 Free bags will encourage people to clean up after their dogs, especially if they have forgotten or run out of their own bags. “Fife Council also needs to check there are enough bins where people typically walk dogs so filled bags are not left littering hedges and paths. In the end, dog waste is the responsibility of dog owners. Parks that will benefit from this scheme include Beveridge Park and Ravenscraig Park, Kirkcaldy; Aberdour Silver Sands; Riverside Park, Glenrothes; Leven Promenade; Lochgelly Public Park and Pittencrieff Park, Dunfermline.